The Benson Tower is a 26 story condominium building located in the downtown Cultural District. It is very close to Portland State University, the Portland Art Museum, and the South Park Blocks. Condo features include stone counters, stainless appliances, gas cooking, and secured parking for most units. The building has a unique water feature around the entrance, a fitness room, and nice owners meeting room. 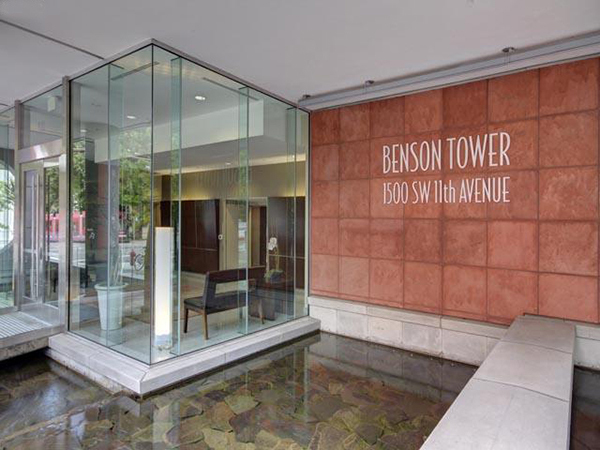 There are 5 listings found for The Benson Tower. Open Sat 4/27 10am-noon. Luxe living in this gorgeous Benson Tower condo with views for miles. Featuring hardwood floors, stainless steel appliances, updated bathroom and a wall of SE facing windows. Relax on the balcony in the morning light; take advantage of all downtown has to offer - steps to Portland Farmers Market, PSU, museums, concert halls, restaurants and more! Fitness center with hot tub, low HOAs, deeded parking. OPEN 4/20 10-12! Gorgeous contemporary NE corner unit at the heart of it all! Floor to ceiling windows showcase downtown views w/private balcony. Hardwood floors, quartz counters, stainless steel gas appliances & cherry cabs. New shelving system adds to closet. Secure building & garage parking (large space w/no neighbor cars),storage, gym, hot tub, private courtyard. Cultural district, blocks to PSU, Art Museum, Restaurants, Theater! Enjoy both sunrise and sunsets in this rare south-facing contemporary condo located in the Cultural District! This 2 bed / 2 bath + den condo boasts beautiful hardwood flooring, exceptional cherry cabinets, large private balcony and deeded storage space. With the Streetcar at your front door and a Walk Score of 98, you're only steps away from PSU, two Farmer's Markets, Portland Art Museum, theaters, restaurants, shopping and more!